We are here to assit you in getting out to the Yacht and onto your holiday. As such we have developed very close working relationships with a number land and airtransport operators. 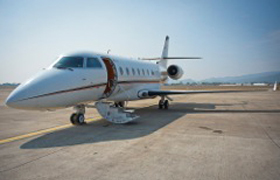 We can arrange for you: Charter Jets, Helicopter Transport or luxury ground transport. Private Jet Charter: Gulfstream G200 service to/from, Moscow, Beijing, India, Japan, Hongkong, Perth, Dubai, Doha and any destination on request. 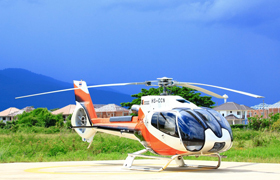 Private Helicopter Charter: We have available a fleet of Eurocopter 130 and 135's at your disposal. There are 250 helipads in Thailand with 10 in Bangkok and one conveniently located in Pattaya. We can arrange your private transport to the closest location based on your preferences. In addition aerial tours can be arranged, just let us know what you would like to do. Private Limo Service: We can also arrange a private limo service to tranport you and your party from anywhere in Thailand direct to the yacht, just let us know where you would like to be picked up. The Gulf Charters Thailand base is located at Ocean Marina at Jomthien beach which is around 20kms south of Pattaya and 120km south east of Bangkok. For many this is the area of choice – just 15 minutes from Pattaya City, guests can party in moderation or opt out completely and use Pattaya as a relaxation destination. Ko Chang is located approximately 350kms south east of Bangkok in Trat province, which lies on the Thai Cambodian boarder. There is a car ferry service that operates between the island and the mainland from 7:00am to 7:00pm departing every 40 minutes or so on the 30 minute voyage. Ko Samui is located approx 800kms south of Bangkok in the Gulf of Thailand and although it can be reached by car ferry from the mainland the Island is best reached by air as the island does have an airport. Bangkok Airways operates several flights per day to and from Bangkok International airport and from other airports in Thailand including Pattaya and Phuket along with some direct flights from other counties.